An early start for me as I had to drop the young fella off at work for a 5am start, home for some breakfast, then pack the bag for the days entertainment. It was a lovely clear morning, a breeze was going to come up, but at only around 10-15kn it was going to be a good day. Left the car at Pam’s, where we met up with Allan, Pam and Allan are members of a local fishing club. Loaded all our gear up and headed down to the marina, awaiting us there were the Cairns Reef Fishing crew Rob and Danny, a quick cuppa, a safety briefing from the skipper then we were under way. It really is a sight as you leave Trinity Inlet and cruise out the leads, leaving the beautiful city of Cairns behind, and head out to the spectacular Great Barrier Reef. The trip out gives us all time to get to know each other, there were about 10-12 of us on this trip, we met a young lady who set explosives in a gold mine under the city of Ballarat, a couple on their honeymoon from Southern California, and a few seasoned locals coming out to enjoy a great day on the water. “FISH ON” was the call, we’d only just dropped anchor, the lines had literally been on the bottom for 30 seconds, “Tell us when you have colour” called the crew. After a torrid fight the first fish of the day showed itself and the crew jumped into action to ensure the catch made its way onto the deck. From then on, it was a fishing action at its best, nearly everyone landed a fish, the crew were kept busy ensuring all the lines spent as much time in the water as possible. After around 45 minutes the bites eased off, and Rob the skipper, called “Lines in” and we moved on to the next spot. This was a welcome break for some, as pulling big reef fish of the bottom can be taxing work, they work hard to pull you into structure looking for cover, and once they reach that cover an extraction can be extremely difficult. So as soon as you feel that “Tap, Tap”, its time to apply the pressure and get ’em of the bottom. Even then your still not safe, as you battle the brute to the surface you can then get hammered by sharks. 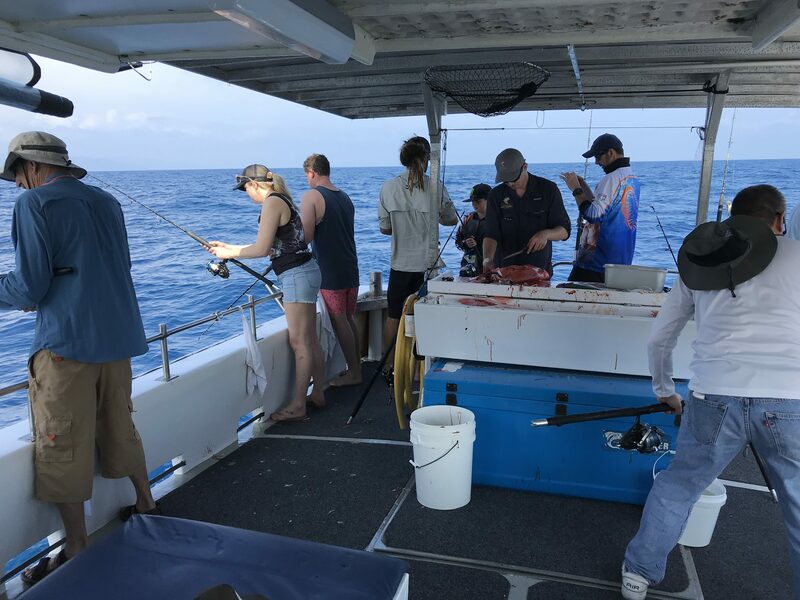 We lost a few fish to sharks, and even hooked one up, this was very entertaining for the entire boat as the bloke who hooked it up had a very tough time bringing it to the surface, eventually he did giving everyone a close up look at these fantastic predators of the deep. We moved a few more times, some spots more successful than others. Then the skipper said we would target some Coral Trout, the next few spots we did exactly that. They really are a great looking fish the Coral Trout, and great eating as well. We were on the water only a few days before one of the annual reef fish closures of the year. 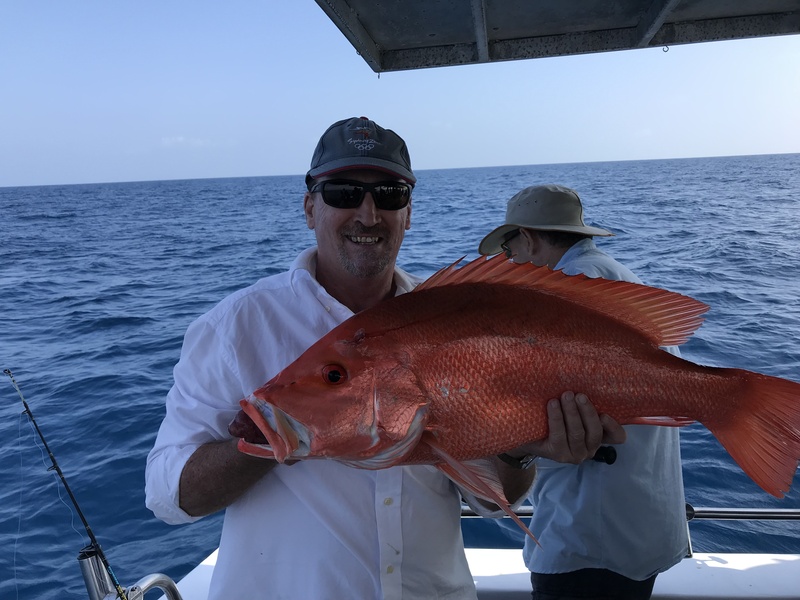 This closure period gives the fish a break during their spawning, and allows all the charter boat operations to get some scheduled maintenance done to their boats and gear. A day on the water, getting an upper body workout hauling in fish, makes for a big appetite. 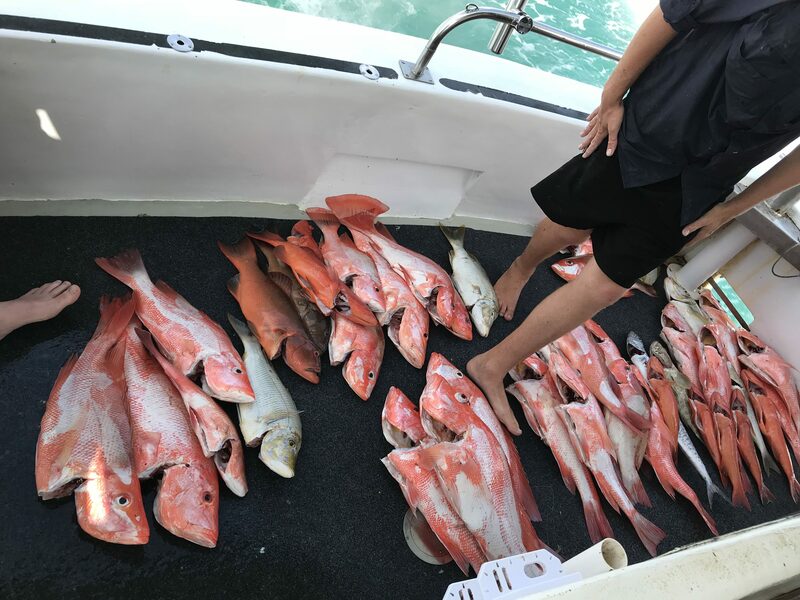 And Cairns Reef Fishing had us covered, the lunch time spread was fantastic, fresh rolls, a wide selection of meats, salads and condiments, it really hit the spot. 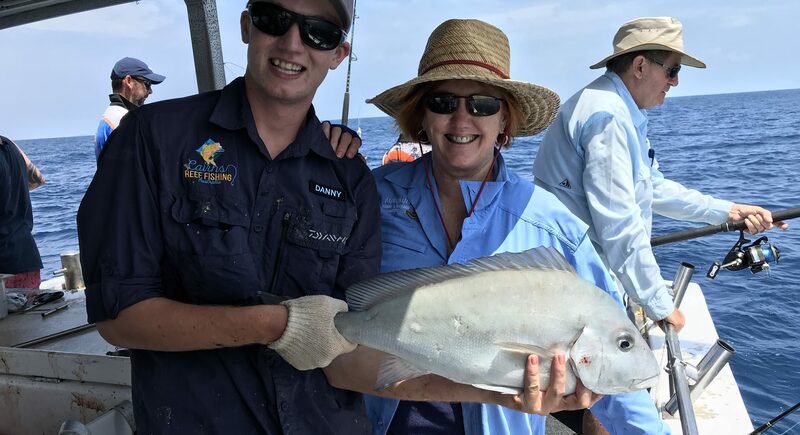 Before we knew it, it was time to head back to Cairns, the crew produced a plate full of fruit and we all sat back and enjoyed the trip home, exchanging tall fishing stories and bragging as the catch was laid out on the back deck and bagged for us all to take home. The conditions were a little lumpy on the day, but the vessel handled the conditions very well, there was plenty of shade on board, this all made for a very pleasurable day on the water. A big thank you to Cairns Reef Fishing, can’t wait to do it again. Call us on 0448 563 586 to secure your spot for a great day out.